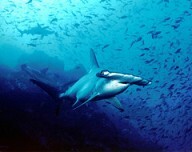 If you are intrigued by sharks in the Caribbean you can enjoy looking at them without having to actually scuba dive. Many shark photography opportunities are highly recommended in the Bahamas. Photographers come from far reaching lands to face their fears with these animals. The Bahamas is well known for its aquamarine waters that are perfect for close encounters and fantastic images. Shark Diver is one of the companies you can become intimate with .